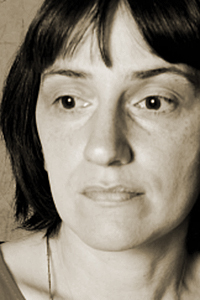 Maya Sarishvili is the author of Microscope, which won the SABA Literary Award for Poetry, and Covering Reality (2001), as well as several radio plays. Her work is forthcoming or has appeared in Guernica, Plume, Asheville Poetry Review, Nashville Review, The Los Angeles Review, Bitter Oleander, and others. Her poetry has been translated into many languages, and she has taken part in numerous international festivals, including Poetry International in Rotterdam (2007) and SOTZIA in Tallinn, Estonia (2008).